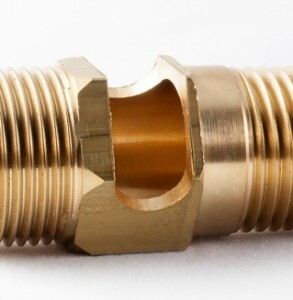 This part is a connector inside a compressed natural gas (CNG) valve body… a vital and beautiful brass component that also demonstrates E.J. Basler Company’s exceptional brass precision machining capabilities. The thread on the outside is actually a specially formed left hand thread for full engagement in the mating part. The broach on the ID and hex on the OD help clock the entire assembly after all parts are mated together. The front lip has a mirror-smooth finish that allows for a “gas-tight” connection to be made. Please contact the E.J. Basler Company today for more information on our brass machining services. In our second precision machined brass components product profile, the E.J. 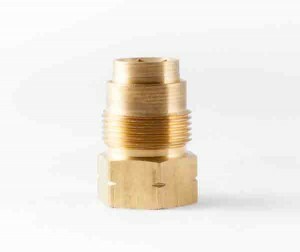 Basler Company would like to share one of our leaded brass valve housings for a very special water faucet.